spillyjane knits: Il faut cultiver notre jardin. The settling-in process continues here at Pittsworth Manor -- I had no idea why I thought it would be over in a week. It's not like I haven't moved before, you know? I'm just so anxious for this new place to feel like a proper home! I know it'll happen, I just have to be patient. Trouble is, I've never been all that good at patience. In any event, the knitting continues. I should be seaming up my Central Park Hoodie, but I'm doing this instead: These are Ulla's Gloves from Nancy Bush's Folk Knitting in Estonia, and I've already picked up three new techniques (the fringed cast on, the vikkel braid and the Estonian inlay technique) so far. I'm even looking forward to the finger knitting process, which either means that I'm a natural glove knitter or totally insane. You pick. And in what might turn out to be another indication of the onset of madness I've joined twitter again. 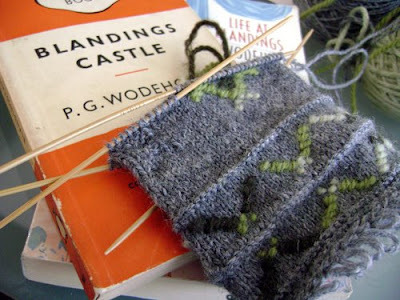 Keep up with my fibrey, housey and gardeny adventures right over here: spillyjaneknits. Yet another place for me to leave my mark online. Gorgeous gloves! Wodehouse is always a treat. Have you seen the Frye and Laurie BBC series? Highly recommended, esp. the 1st season. April 20, 2009 at 12:39 p.m. I love the fringey cast on! Enjoy the new house. I'm sure it will feel like home soon. April 21, 2009 at 9:04 p.m.